Thank you to all the Cardholders who submitted their completed ProCard/GoCard Statement Reconciliations using the new paperless submission process. We hope you had a positive experience in submitting the reconciliation. Unless the file size is greater than 10MB, please consolidate your itemized receipts and backup documentation into one file. Do not create a file for each type of documentation. Save ProCard/GoCard Statement in a file separate from the one with itemized receipts/backup documents. When filling out the ProCard/GoCard submission form in the FTS portal, the name and contact information of the cardholder will populate in fields when their EmpID is entered. If they do not, then check the Employee ID to ensure it was entered correctly. Cardholders and Approving Officials must provide electronic signature on the statement using DocuSign. Scanned documents with wet signatures will be returned to Cardholders for proper submission. For assistance with the new submission process, we have updated the ProCard/GoCard Reconciliation process guide, scheduled additional Finance Open Lab sessions, and prepared a video tutorial on using DocuSign for signatures. 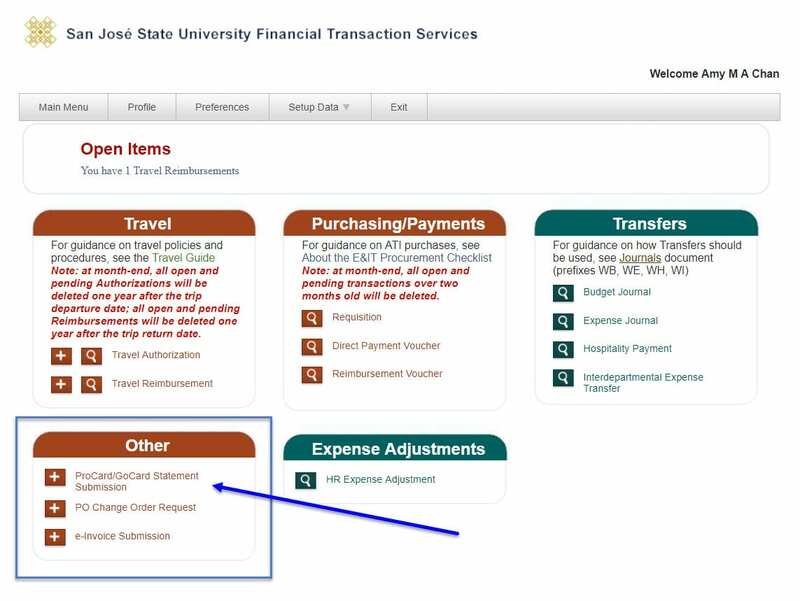 If you have any questions, please contact Finance Support at financeconnect@sjsu.edu or 4-1558. Thank you. Figure 1: Statement header displays the invoice number, invoice date and cardholder’s information. Click on image to enlarge. We are proud to announce the ProCard and GoCard process has gone completely paperless! ProCard and GoCard statements are to be signed by the Cardholder and forwarded for review and approval to Approving Official in DocuSign. Cardholders are to save their documentation in two files: (1) the DocuSigned statement and (2) all required itemized receipts and backup documentation. 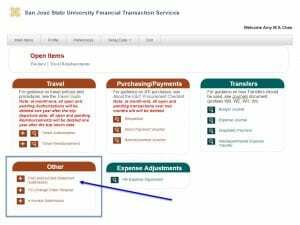 The completed and signed ProCard/GoCard Statement and itemized receipts/backup documentation files are now to be submitted by Cardholder via FTS. Look for the new module “Other”. FTS is now ready to accept February submissions. It is open to all university employees so there is no need to request access to it. Cardholders will no longer scramble to get their reconciliation into the Accts. Payable Office by the deadline (especially timely because we have moved off campus). A confirmation email will be sent to the submitter when a reconciliation submission is completed in the portal. An easy submission process. All the information needed to complete the FTS form can be found in the statement. In an effort to put everything in one place, we have also added PO Change Order Requests and e-Invoices to the new FTS module “Other”. Meet Accounts Payable’s timeline for completing the reconciliation. Complete their statement reconciliation in CFS. Organize the itemized receipts and backup documentation in the order transactions appear in the statement. Forward reconciliation to Approving Official for review and DocuSign signature. To assist users with the new submission process, we have updated the ProCard/GoCard Reconciliation process guide, scheduled additional Finance Open Lab sessions, and prepared a video tutorial on using DocuSign for signatures. If you have any questions, please contact Finance Support at financeconnect@sjsu.edu or 4-1558. We would like to thank our IT partners, especially Leon Nguyen, for helping us achieve this major milestone in the effort to make all of our business processes paperless. Figure 1: New module “Other” in FTS. Click on the image to enlarge.